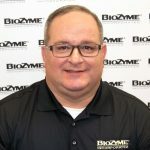 BioZyme® Inc., announces hiring Cory Nichols, Blanco, Texas, as its Director of National Sales-South. Nichols brings numerous years of diversified sales experience to the position, as well as a background in the livestock industry. Nichols has a life-time career in sales in various industries that range from construction equipment to human pharmaceuticals. He was raised on his family’s diversified row-crop and hay farm in Iowa and was involved showing Angus cattle through the National Junior Angus Association while growing up. He earned a bachelor’s degree in Animal Science with an emphasis in Business from Oklahoma State University, where he was a member of the 1990 National Champion Livestock Judging Team. Nichols will work closely with seven of the 19 area sales managers to help them expand their dealer networks and work with existing dealers to grow their sales by educating customers and potential customers about the benefits of the BioZyme product lines. All BioZyme products contain Amaferm®, a precision-based prebiotic designed to amplify intake, digestion and absorption of feedstuffs to maximize performance of the animal. Nichols and his wife, Suzanne live in South Central Texas, with their sons, Brock and Gage, who are both active in FFA and showing steers. To contact Nichols or any member of the BioZyme sales team, visit http://biozymeinc.com/our-staff/.